Instead, time travel is controlled by universities. The time travellers are academics, using time travel as a tool to learn about the past. Practical historians, so to speak. Our protagonists are Kivrin, a graduate student on her first time travel trip, and Professor Dunworthy, a mentor who is worried about her. He's staying behind in the future, while she is sent to the 1300s alone. The book follows Dunworthy to begin with. He's clearly gotten a bit protective over Kivrin, but he has good reasons to be worried. It's the first trip going that far into the past; it's taking place just before Christmas and only going ahead because of some departmental power-grabbing and politicking while the man in charge, Basingame, is away; the entire trip is rushed without taking all the preliminary precautions that they usually do; and sending a young woman to Medieval times on her own is far riskier than sending a man, as young women were not generally allowed to live independently in that time period. In short, everything about this trip is ill-considered. The only thing to give him confidence is Kivrin's competence, and the years of hard work and academic preparation she has invested into getting ready for such a journey. I'm not going to give away any more plot points. In fact, I'd urge you not to read any blurbs, not to read the back cover, not to read much about this book at all. If you haven't read this book, just buy it and read it: it'll be a rewarding experience. 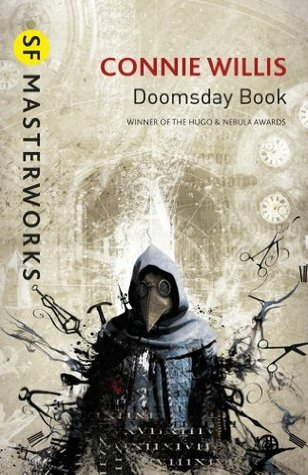 Doomsday Book excels at connecting the reader with the characters. It is written with empathy and love for the people in this book, and they are each complex and sometimes complicated people, totally authentic and believable. There are some characters who are not likeable, but even those are authentic. No evil villains in sight, just selfish, callous, petty people with small minds and little concern for others. There are some things which the book does not get quite right. Published in 1993, it envisions a 2060 without having foreseen mobile phones and the internet. Instead, it imagines video phones on landlines. This gives the book a slightly quaint feel. The other thing which may hiccup the reading experience a little is the circular and repetitive way that characters think. It's perfectly authentic: people really do churn over the same mental ground over and over and over again, but it can also be a little annoying. In the moments of slower plot movement, this can chip away at a reader's patience. One warning: it's not called 'Doomsday Book' for nothing. It does get absolutely devastating at times, and the story pulls no punches. PS: Now I now where Just One Damned Thing After Another got its central ideas from. It's basically a light entertainment reimagination of Connie Willis' Oxford Time Travel books.